You are at:Home»Health & Outdoors»Is it safe to grow your own food inside tyres? 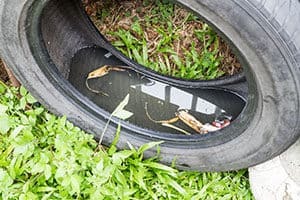 A used tyre, left outside in sunshine and rain will weather and will eventually leach these chemicals, and others like mercury, lead, cadmium, into the soil. The older the tyre gets, the more it will deteriorate and the more some of these chemicals might find their way into your allotment or garden soil which means they could eventually find their way into the food you grow and eat. Of course powdered tyre residue finding its way up and down our high streets contaminating leaves and washing into drains and streams is more of a health issue than a single large used tyre on an allotment. We should probably be far more worried about that issue! However, for me it’s all part of one big set of chemical exposures which we are all faced with daily, we should do everything possible to mitigate the risk to our health and that of the wildlife around us. What does the science say about tyre leaching? leached compounds at site: levels of manganese and iron are likely to be elevated in groundwater when steel is exposed. Levels of aluminium, zinc and organic compounds may be elevated in groundwater. Levels of zinc, cadmium and lead may be elevated in soil. So are tyre chemicals really worth worrying about? Only use a worn tyre to grow food for 2-3 years. Slow down the tyre’s deterioration by storing it under cover when not in use (in a shed during winter for example). Reduce the tyre’s contact with soil and ground water by placing it on top of a sheet of wood or on top of a pallet (or both). The wood may absorb any chemical run off instead of the soil beneath. 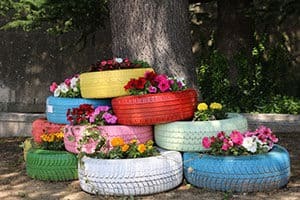 Consider growing flowers in tyres rather than vegetables, you’re less likely to eat those. On a somewhat related note something I stumbled across whilst writing this article was the prevalence of young goal keepers being diagnosed with cancer after they have had long term exposure to artificial football pitches   . Since early 2000 these pitches have been covered with something called ‘tyre crumb’ which consists of tiny pieces of old tyre. One pitch requires 120 metric tonnes of shredded tyre (or 20,000 old tyres). It’s a handy way to dispose of old tyres when landfill rules have limits… More worrying is the evidence of the scientific tests highlighted in that Ministry for the Environment of New Zealand report – that very clearly said that ‘tyre crumb’ was more of a contaminant than whole tyres. We’ve got children dancing around on this stuff, falling on it, scraping their knees on it… I for one will be very carefully monitoring the exposure my young son has to these possibly carcinogenic football pitches in future. Benzene: A carcinogen, developmental toxicant, reproductive toxicant. Can cause bone marrow failure, and has been linked to aplastic anemia and acute leukemia. Many PAHs and their epoxides are highly toxic, mutagenic and/or carcinogenic to microorganisms as well as to higher forms of life including humans. Automobile tires – a potential source of highly carcinogenic dibenzopyrenes to the environment. Are synthetic fields a major cause for concern? Are artificial sports pitches causing cancer?